What Day Of The Week Is September 7? 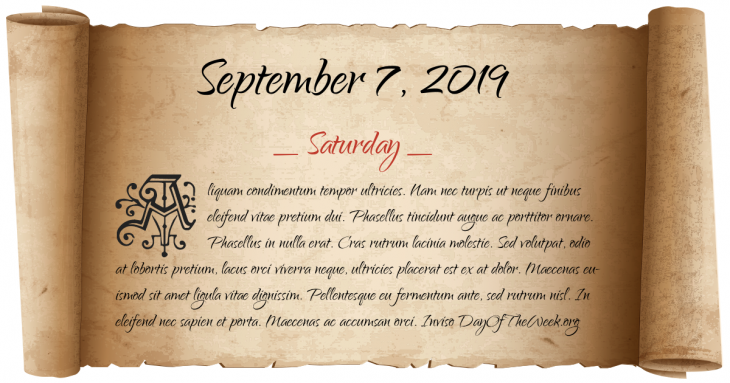 September 7, 2019 is the 250th day of the year 2019 in the Gregorian calendar. There are 115 days remaining until the end of the year. The day of the week is Saturday. Napoleonic Wars: Battle of Borodino – Napoleon wins a Pyrrhic victory over the Russian army of Alexander I near the village of Borodino. Cunard Line’s RMS Lusitania sets sail on her maiden voyage from Liverpool, England to New York City. Legion of Mary is founded in Dublin, Ireland. World War II: The Blitz – Nazi Germany begins to rain bombs on London. This will be the first of 57 consecutive nights of bombing. Who were born on September 7?